The Working Harbor Committee will be presenting the annual Tugboat Race this Sunday, and I hope you’ll be able to make it. The shots in this post are from last year’s race, which I had the privilege of attending. This is a rare opportunity, from a photographic point of view, to witness this sort of thing. Dynamic, colorful, quick moving- a challenge. 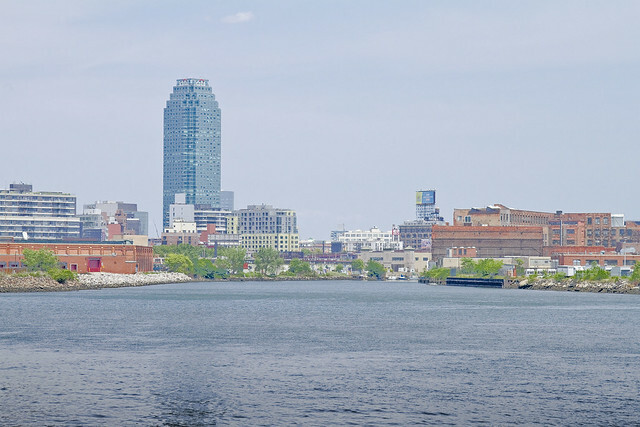 Hudson River Park Pier 84 at West 44th Street, Manhattan – 9:30 a.m. – 2 p.m.
Events include a tugboat parade, a mile-long tug race, nose-to-nose pushing contests, line-throwing, spinach-eating and tattoo competitions. Best viewing is from a Circle Line spectator boat that will follow the on-the-water action. Good viewing from shore along the West Side riverfront, at Pier 84 and at the Intrepid Museum pier. To attend the race, one must simply show up at the pier and enjoy, however the best views (and photos) will be available form the Circle Line observer boat which will labor to keep up with the fleet of contestants. Details on ticketing for the Circle Line boat appear at the bottom of this posting. Note: As a disclaimer, I’m a member of Working Harbor Committee, but strictly as a volunteer (It’s a non profit organization and I receive zero proceeds for promoting the event). Public Transportation: Any subway to 42nd Street, westbound 42nd Street crosstown bus to the last stop. Working Harbor comes up a lot here at Newtown Pentacle, whether it be in the context of the Newtown Creek boat tours or the many “Hidden Harbor” trips which they produce. What doesn’t get mentioned that much are the groups many efforts at promoting and revealing the harbor as a career choice for kids from the inner city, it’s annual Senior Tours (produced in conjunction with the offices of the Borough President of Manhattan) which offer a free day on the water to senior citizens, and a host of smaller events which go largely unsung. They’re a good bunch of joes. New York, New York, August 30, 2011: The Great North River Tugboat Race and Competition-one of New York City’s most popular Labor Day weekend events-returns for the 19th year on Sunday, September 4. 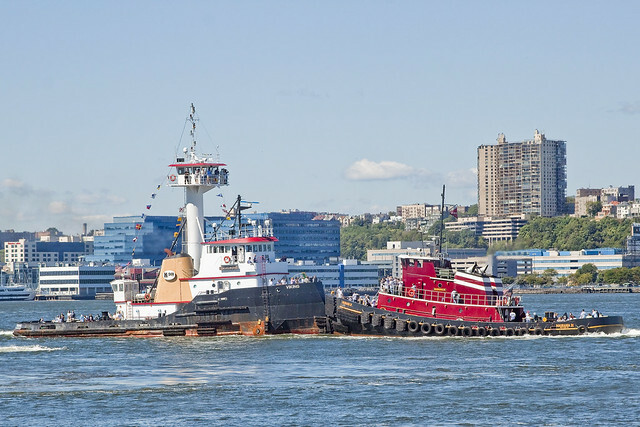 More than a dozen tugboats, the maritime 18-wheelers that normally dock ships and push barges, will thunder down the Hudson River Sunday morning as they vie to be named the fastest boat in their class. The race, on a one-nautical-mile Hudson River course that extends from about West 70th to West 44th Streets, typically draws thousands of spectators, some watching from shore; others getting right in the middle of the action aboard a Circle Line spectator boat that travels alongside the tugs. 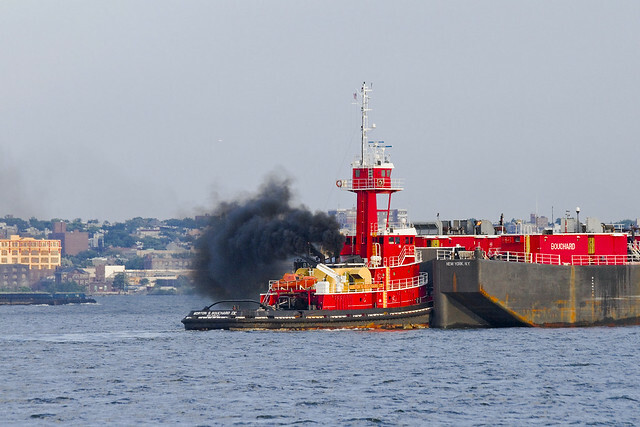 This year, tugs will range from 100-foot, state-of-the art 5,000-horsepower workhorses to a 25-foot, 200 horsepower workboat, named The Bronx, to a century-old harbor tug, now a museum ship, named Pegasus. 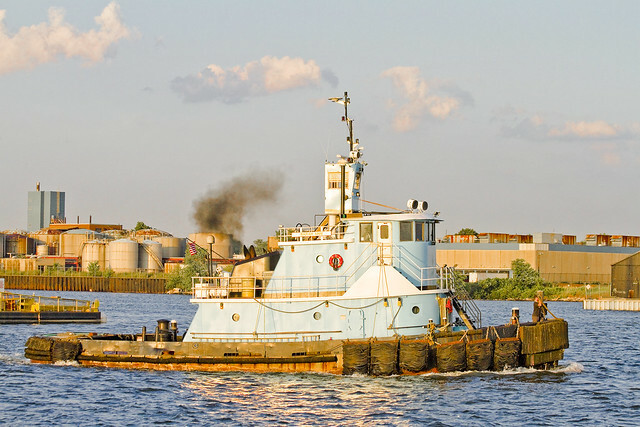 Working boats from many of New York Harbor’s major towing companies will also complete, including tugs from McAllister Towing and Transportation, Miller’s Launch and Donjon Marine. A handicap system will give smaller and less powerful boats a chance to win trophies. The race typically draws thousands to the riverfront, which is one of the reasons the tug companies enjoy participating. 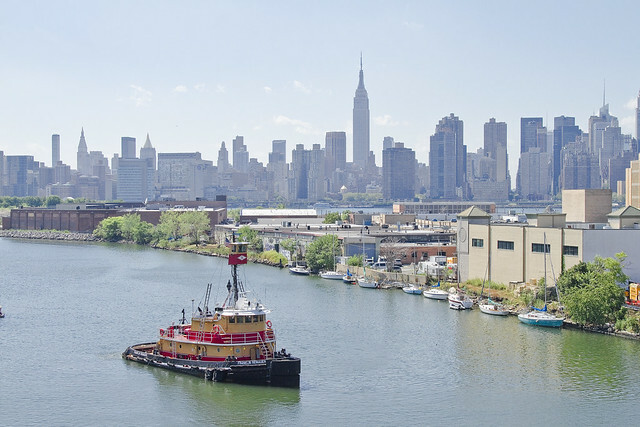 “New Yorkers sometimes forget they are surrounded by water, and that there is a whole maritime industry working here. 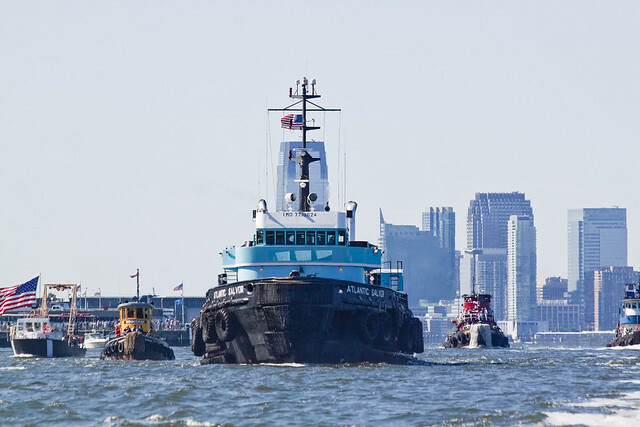 This tug competition is the one time a year people can really see what we do,” explained Craig Rising of McAllister Towing and Transportation, one of the largest and oldest tug companies in the country. 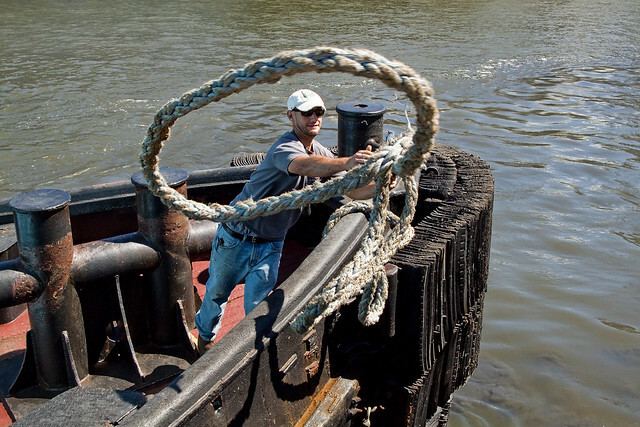 It is also a field day for the tug crews, many of whom bring their families aboard. 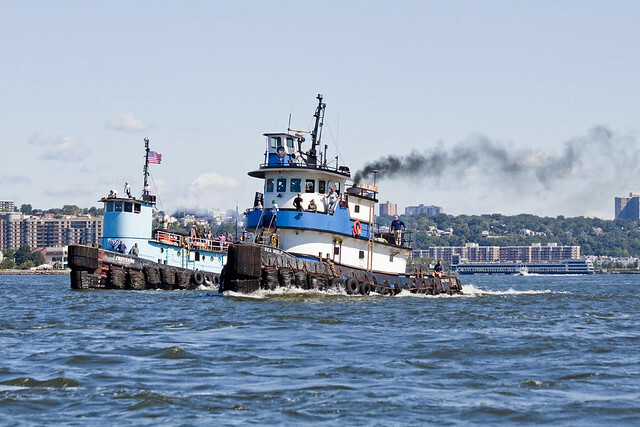 This is a great party on the Hudson, and a tremendous boost for the crews of the maritime tugs which seldom get a chance to show off their skills and incredible hardware to the public. In addition the race itself, there are “best maritime tattoo” and “spinach eating contests (Popeye brand spinach, natch)“. Line throwing contests are scheduled, as well as nautical knot tying classes for kids. 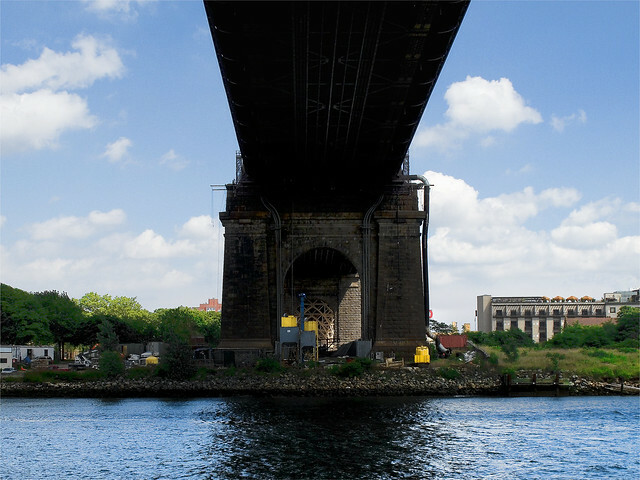 Family friendly, the event will be at Pier 84 (just south of the intrepid and just north of 42nd street), and the spectator boat will be boarding at the Circle Line pier at 42nd street and the Hudson River. The tug race spectator boat will be a Circle Line Sightseeing Boat. It will depart at 9:30 from Circle Line’s Pier 83 at 43rd Street and 12th Avenue (boarding will begin at 9 a.m.), and it will return at 11:30 a.m., so that passengers can walk just one block north to the events on Pier 84. Tickets are $30 adults; $25 for children under 14. Free for ages 4 and under. Tickets can be purchased in advance online at http://www.workingharbor.org or at the Working Harbor Committee tent on the north side of Pier 83 on the day of the event. 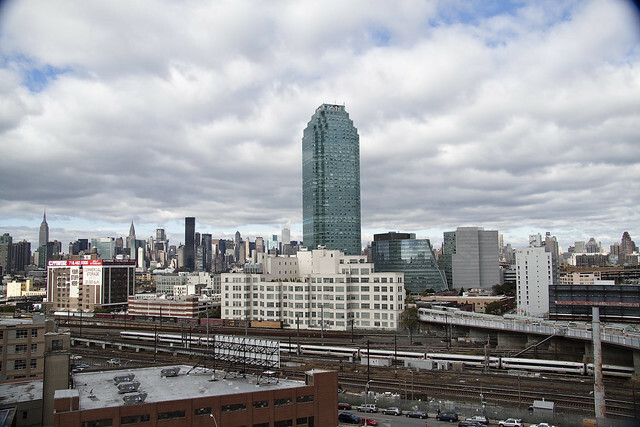 Admission to the Pier 84 events is free. The race is organized by the Working Harbor Committee, a not-for-profit organization dedicated to spreading the word about the rich history, current vitality and future potential of the New York/New Jersey Harbor. The organization also provides Hidden Harbor Tours® and runs an extensive youth educational program. Full information is available at www.workingharbor.org. 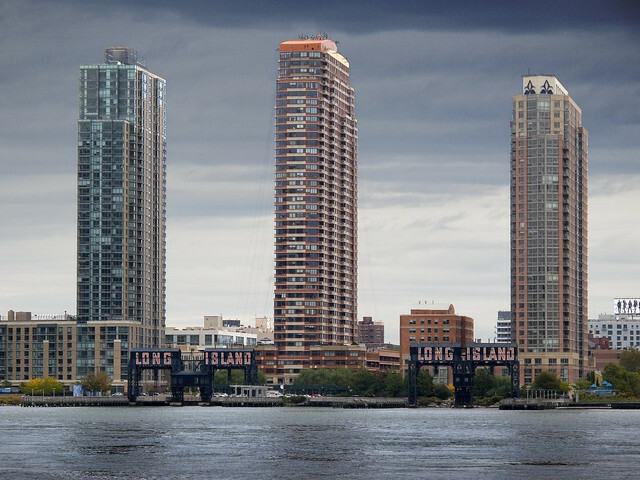 Friends of Hudson River Park and Circle Line 42 are co-sponsors. As soon as the rain died down, I descended from Newtown Pentacle HQ here in the rolling hillocks of Astoria to the so called “Zone A” to see what Irene might have wrought here in western Queens. The shot above is from Second Street near Borden Avenue, at the largish worksite which Skanska has been employing hundreds for the last few months. 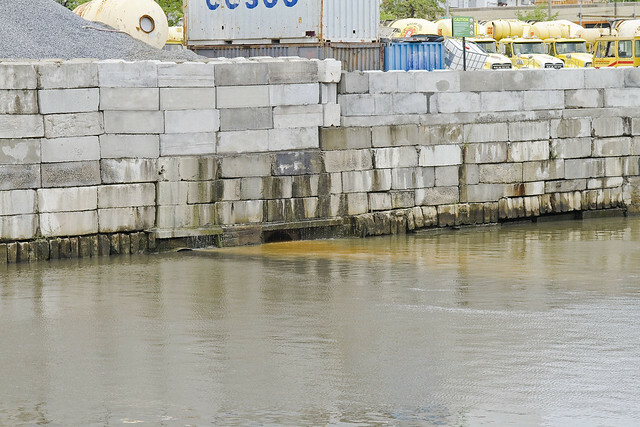 Cleverly, the construction giant had dug a diversion ditch to allow storm water drainage. “There will be plenty of cameras walking around in Tower Town, so it would be silly of me to spend much time there” were the actual words spoken to my walking companion, who we’ll call the Charismatic Croat (CC). CC was also told that we’d be taking a short walk, and would be back in a half hour. He’s used to my lies and wasn’t surprised when we had inexorably headed for another part of “Zone A”. 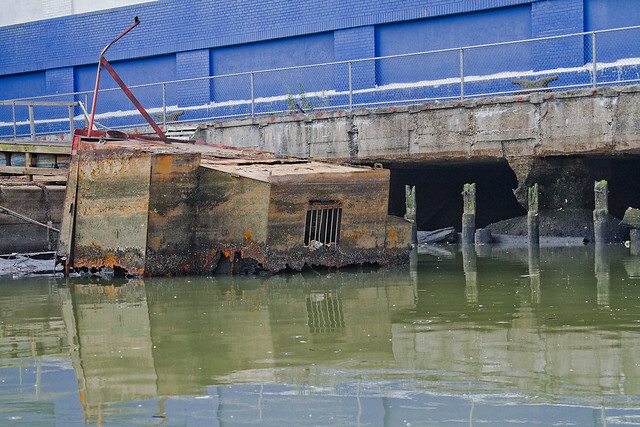 All through the storm, I was wishing that I had the camera out at Newtown Creek, or at least Dutch Kills. Curiosity about the actions of the much feared storm surge upon the fragile bulkheads of Dutch Kills was killing this cat, and I dragged CC back and forth over these streets. There was some flooding, but in the usual places that flood anyway. Back on 2nd street, a few nice shots of the surge were captured by Jesse Winter and others, and an actual wave of East River had risen up and flooded 2nd. The Crab House was bailing water from their basement and more than one giant puddle still remained. 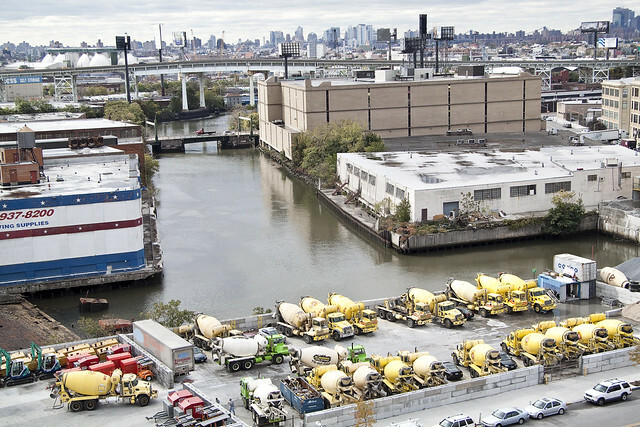 Down at Dutch Kills, 29th street and the large truck yard which houses this cement company were under a foot or more of water- but they are regularly immersed by small amounts of rain anyway. 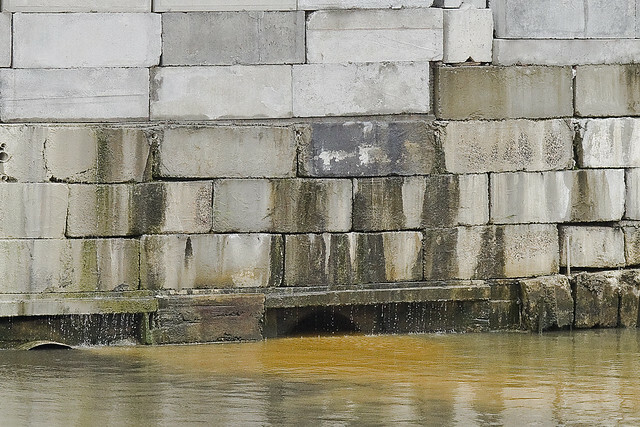 What made the day noteworthy, from a Newtown Creek point of view, was this little river of urban chocolate flowing out of one of the many CSO’s (Combined Sewer Outfall) which are found abundantly along the waterfront of the Creek and it’s tributaries. It smelled just the way it looks like it might. One often sees discharges coming from these CSO’s, but this was just a spectacular flow. I will point out that this could be soil washed into the pipes during the tremendous amount of rain which Irene brought to Queens. It could be sand or actually be a chocolate spill at some industrial confectionary which got washed into the sewers or something. That’s what I said to CC at the time. Doesn’t smell like chocolate, the Charismatic Croat opined. A continuing fascination with the complexities of maritime photography has taken up quite a bit of my summer in 2011. Tugboats, in particular, demand attention whenever I’m on or near the water. It probably has to do with having recently sold a couple of tug shots to the NY Times, illustrating an article in the weekender section profiling the Working Harbor Committee. When you get paid for something you enjoy doing, life attains symmetry and seems to have a purpose, especially when the people writing the check are “the paper of record”. As has been my habit since childhood, late summer is when I assess “how it’s going”, figure out what isn’t working in my life and try to formulate a plan to get “back on track”. It’s been a great few months: working with Forgotten-NY and Greater Astoria Historical Society on their ambitious “2nd Saturday” series of tours, assisting the Working Harbor Committee with their multitudinous tours and events, helping design and produce an event for the New York City Centennial Bridge Commission, and conducting my own boat tours of Newtown Creek for Working Harbor and Metropolitan Waterfront Alliance’s City of Water Day. I’ve also presented the Magic Lantern show three times this summer- at Greater Astoria Historical Society, City of Water Day, and at a DEP event. 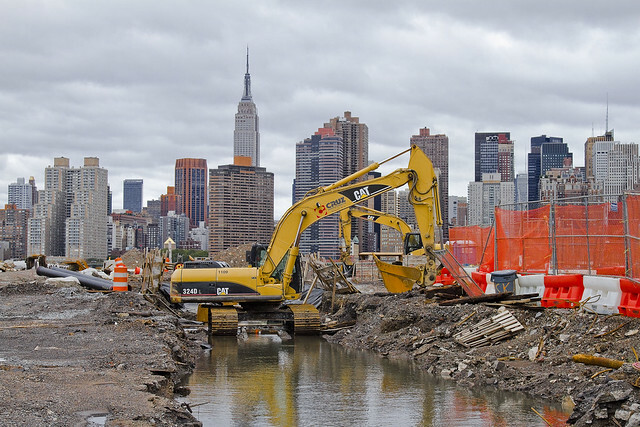 Additionally, Newtown Creek Alliance’s various events, presentations and public meetings have kept me quite busy. However, in the midst of working with all these wonderful people, my own operation and schedule has been damaged by inattention. One thing which is foremost in my mind, and which will be rectified in the coming weeks and months as we slouch toward fall and winter, has been the irregular schedule of postings here. Apologies are offered, contradicting my normal credo of “never complain, never explain”, but this blog is essentially a one man operation (although special kudos go out to Our Lady of the Pentacle and Far Eastern Correspondent Armstrong for unbelievable effort and support). Massive effort is underway to resume a normal and regular schedule of postings. There will be one more HUGE announcement coming about a Newtown Creek event I’ll be offering in October, but I’m contractually obligated to not be more specific about it than that. In short… Back in session. 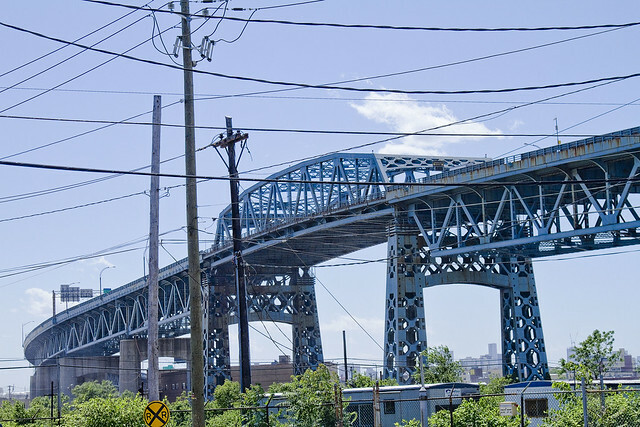 A virtual guarantee is offered that this is the only posting you will see today commemorating and wishing the Kosciuszko Bridge a happy 72nd birthday. 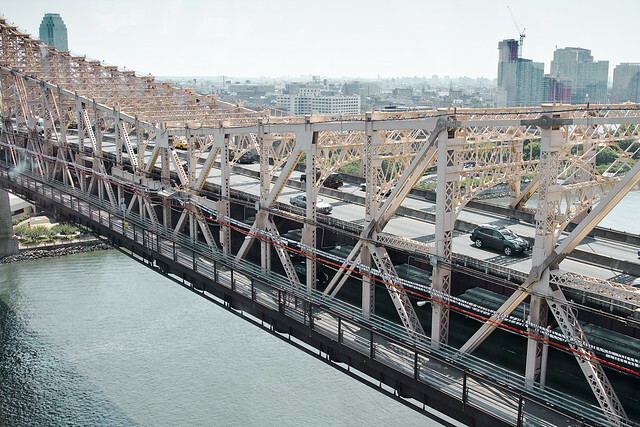 Some 26,298 days ago, Robert Moses saw the first link in a crazy idea of his which would one day be called the “Brooklyn Queens Connecting Highway” open for business. The Meeker Avenue Bridge opened on August 23rd, 1939 (renamed in 1940 as The Kosciuszko Bridge) – some 631, 152 hours ago. It was promised to allow easy egress to the World’s Fair, and was a showpiece project for the Great Builder. 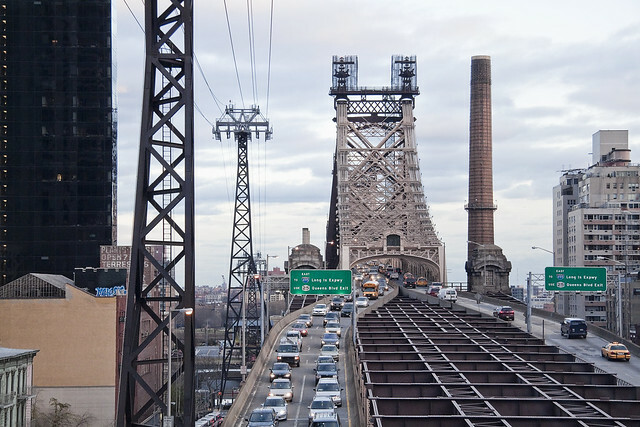 Damned Once- The Kosciuszko Bridge catches radio frequency emissions from several nearby commercial radio broadcast antennas. A lot of it. 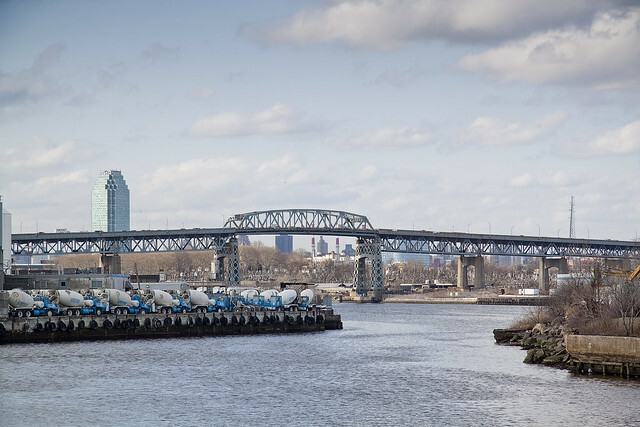 Whatever knows fear burns at The Kosciuszko Bridge’s touch. 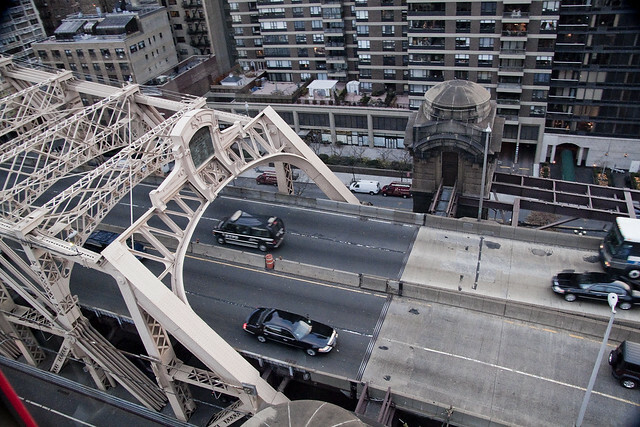 Damned Twice- The Kosciuszko Bridge is at extreme risk in the eventuality of a seismic event. 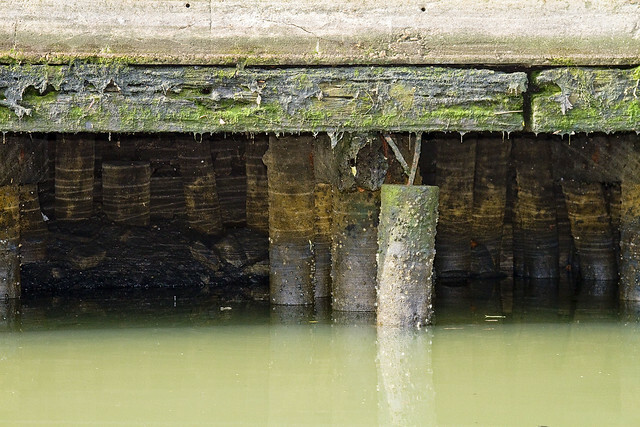 The Brooklyn pier actually sits on the Creek bed, some 6 meters below grade, but the Queens side is anchored on piles driven into the mud. 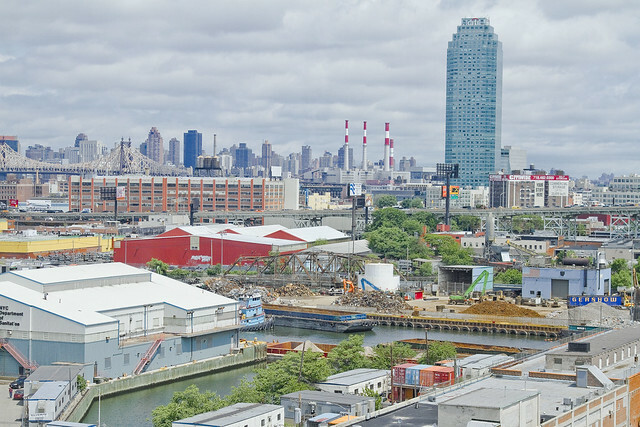 The hard soil around Queens Plaza will merely shake, but the land surrounding the Newtown Creek will liquify. Damned Thrice- The Kosciuszko Bridge once had pedestrian walkways, but they were removed in 1961. 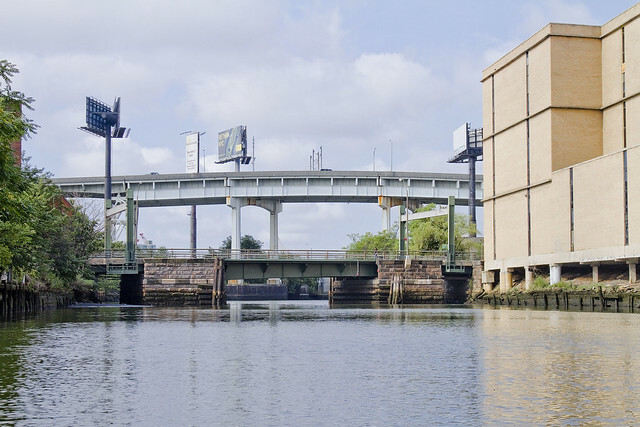 Can you imagine what kind of photos would be possible on a pedestrian walkway 124 feet over the Newtown Creek? 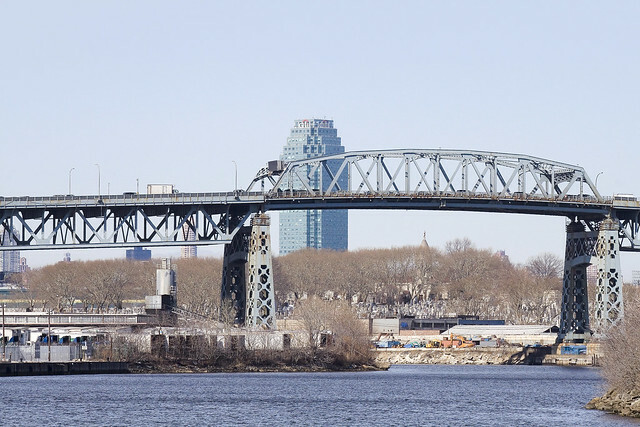 Like many things and people who are 72 years old, the Kosciuszko Bridge is not long for this world. Why not raise a glass to it tonight, and acknowledge its long service to the City? 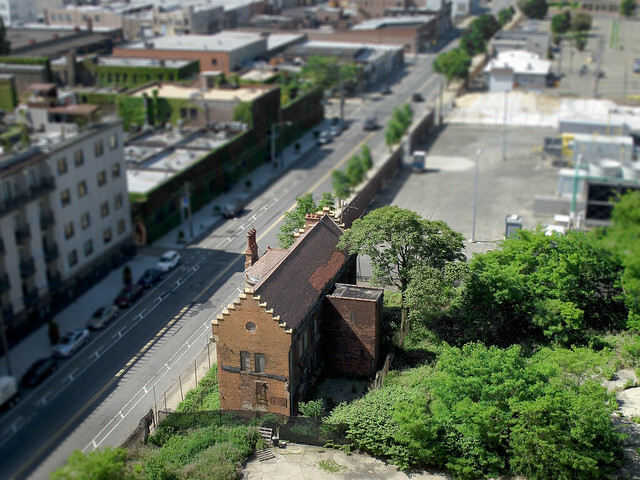 An aerial shot from the former Loose Wiles biscuit factory (and modern day LaGuardia Community College) which shows the totality of the Dutch Kills turning basin and the properties which surround it. 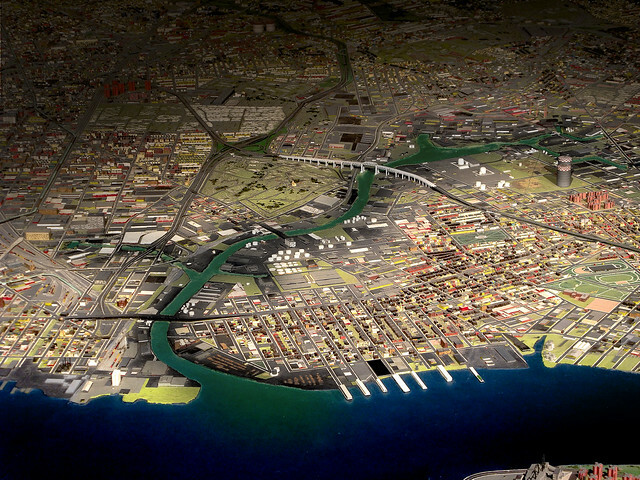 Special notice of the cement factory and the red white and blue self storage warehouse should be taken, and the Hunters Point Avenue Bridge and Long Island Expressway (just above center) which were described in earlier posts are also pointed out. Additionally, notice the two sunken barges in the lower left hand corner of the shot. 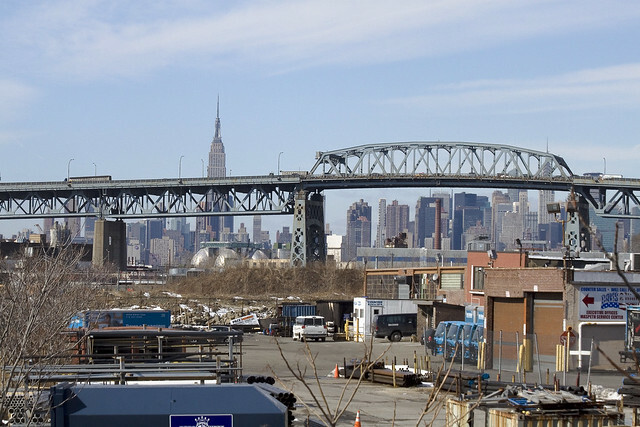 click for parts one, two, and three of this trip down Dutch Kills. 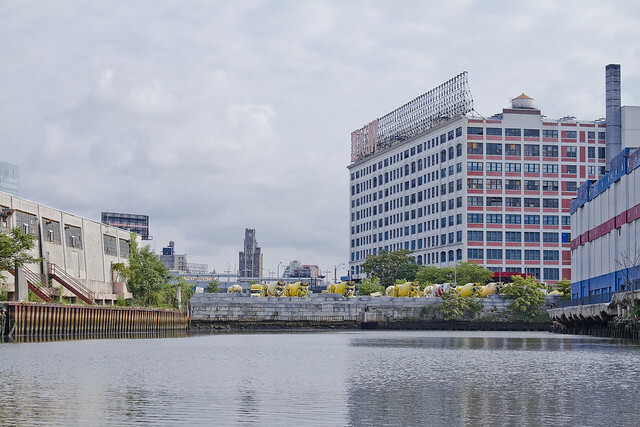 This is the last of the four postings describing what I saw at Dutch Kills while on a Newtown Creek Alliance assignment. 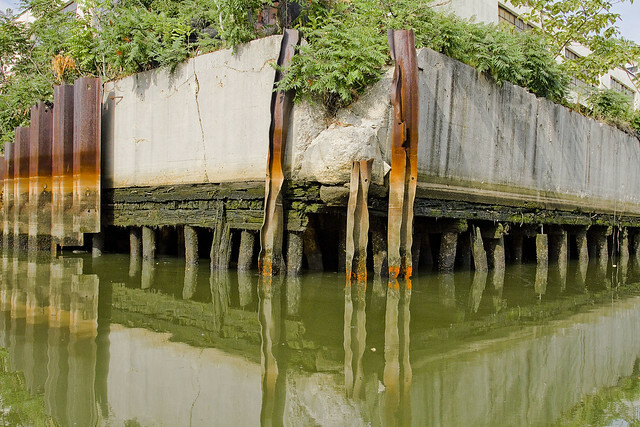 The stated mission of this exhibition was to catalog and photograph the little known bulkheads and shorelines of Newtown Creek and it’s various tributaries, and NCA had arranged for Riverkeeper to ferry us back and forth across the troubled waterway. 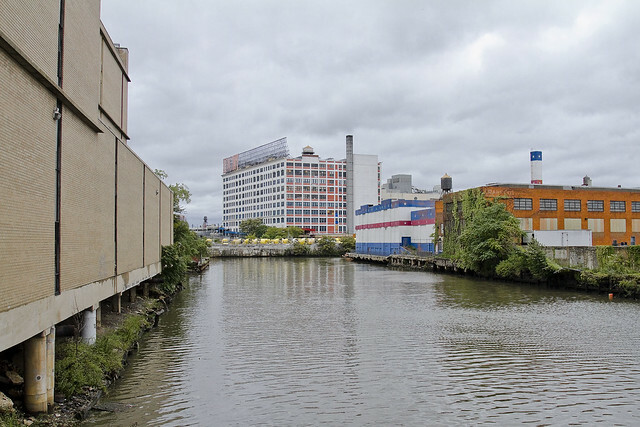 Troubled is a politically correct way of describing the Newtown Creek watershed which native New Yorkers would translate into local patois as “all ‘effed up”, or which a military man would call “FUBAR”. Risible, the state of decay along these shorelines is startling. 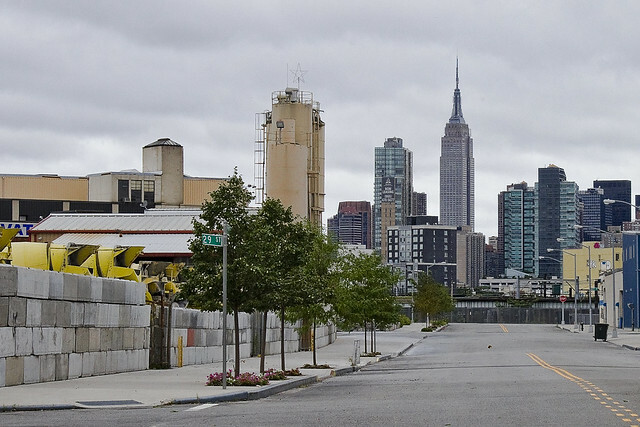 Dutch Kills has been largely abandoned by maritime interests, despite its once proud role as the central artery of the industrial complex called the Degnon Terminal. 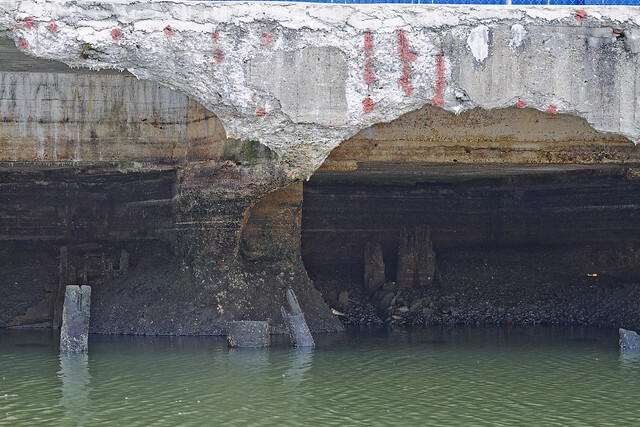 The corrosive affect of estuarine water upon cement and underlying steel has rotted away the manmade shorelines and bulkheads, carving away the efforts and labor of whole generations. 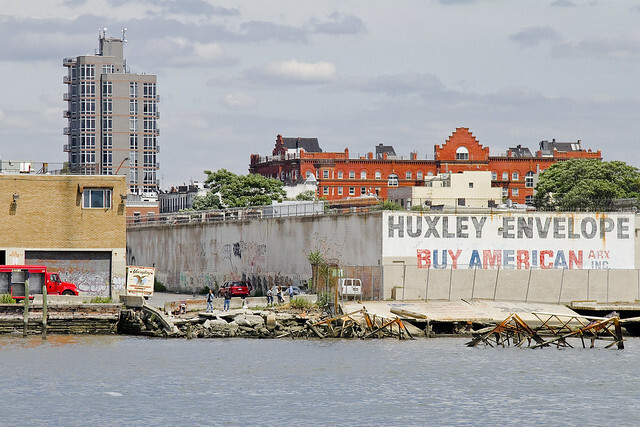 There is no reason to say the name of the corporation which occupies the red, white, and blue self storage warehouse which sits above these pilings. It is immaterial to adjure any organization in Queens, whether it be governmental or corporate, for no one cares. 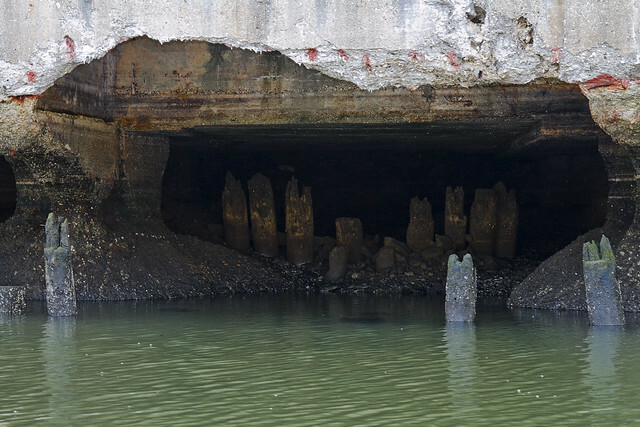 It is remarkable, though, that the corrosive action of the waters of Dutch Kills have so undermined the foundations of this structure that grottoes have formed amongst its pilings. Remember, this was swamp land as late as the first decade of the 19th century. When Degnon’s people began their work here, at the Waste Meadows, there was barely any solid land between Hunters Point and Blissville. 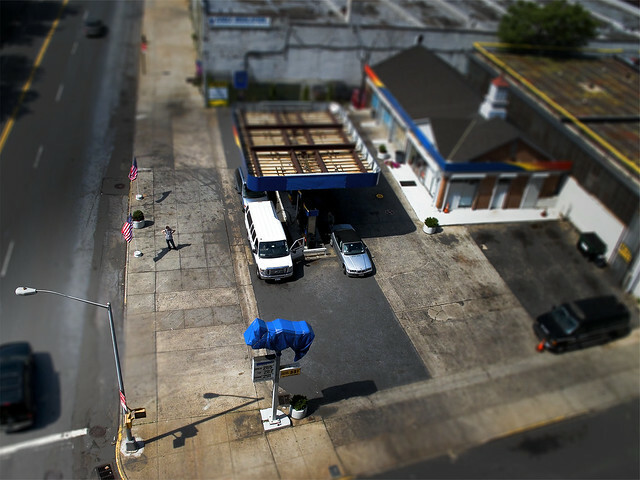 The LIRR, of course, had built their tracks sturdily and have no doubt that Standard Oil had engineered their grounds with proper drainage and stout foundations- but the inland path along Dutch Kills was nearly worthless. Degnon owned a construction company which was capable of doing the impossible, and his people had a special affinity for problems involving water. They made their name during the construction of the second East River (or Williamsburg) Bridge, were involved in the taming of the Wallabout Creek, and had recently been engaged by the newly consolidated City of Greater New York to complete the rail tunnels which would link Queens to Manhattan via the novel new Subway system. 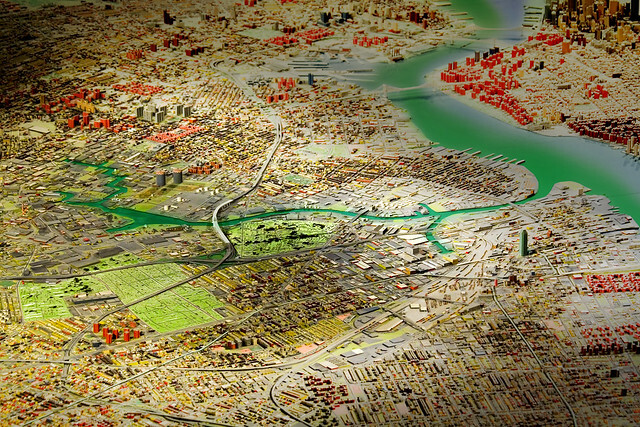 Those tunnels excavated a large amount of spoils and borings, which would be used to create the very ground around Dutch Kills as “landfill”. By the first decade of the 20th century, enough compacted landfill was here to begin pouring concrete slabs, and upon those slabs the Degnon Terminal rose. This post will not cover the entire story of the Degnon Terminal. I would refer you to trainsarefun.com, and forgotten-ny for facets of the story, or suggest a visit to the Greater Astoria Historical Society for an attempt to get them to share their expertise on the subject. The tale of Michael Degnon is the stuff of scholarly dissertation. Degnon is buried in Calvary cemetery, and I suspect he rests uneasily because of what lesser men have done to his legacy. 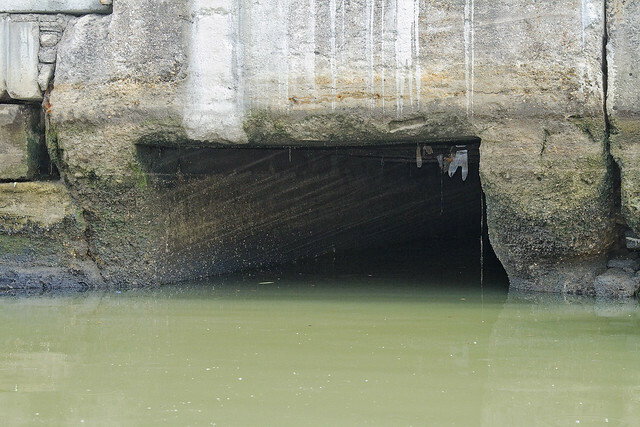 There are two sunken fuel barges here, rusting away into history. 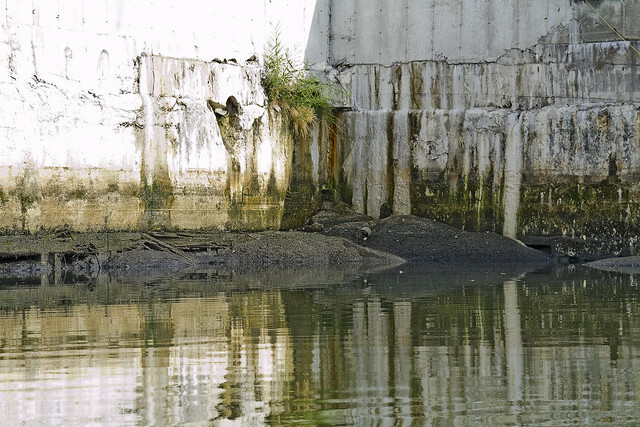 Pictured above is the CSO Outfall BB-026 which vomits untreated storm water and sewage into Dutch Kills regularly, and it is one of the primary sources of water flowing into Dutch Kills. 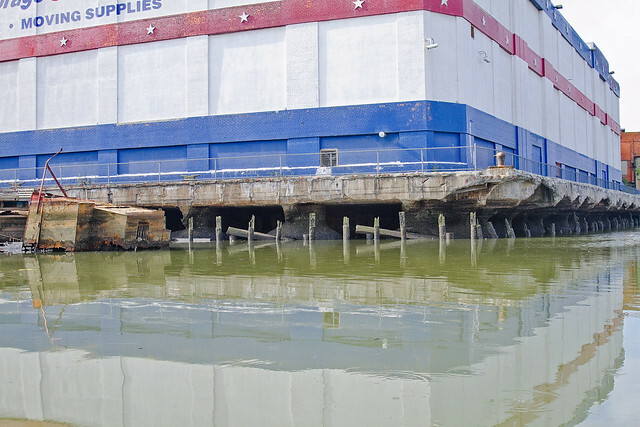 The boat began moving in a counter clockwise fashion at this point, swinging away from the 29th street address of the red, white, and blue self storage warehouse and toward the concrete factory. I’m unfamiliar with the role and identity of the two large pipes which are found beneath the concrete facility. The enormous slab of cement the factory is situated upon was once a rail switch, where short trip rail engines would await incoming barges. Once unloaded, these short trains would make deliveries to the industrial concerns which surrounded Dutch Kills. Apparently, no small amount of conflict has arisen between the concrete company and environmental watchdogs over the years, but your humble narrator makes it a point of staying out of this sort of thing. 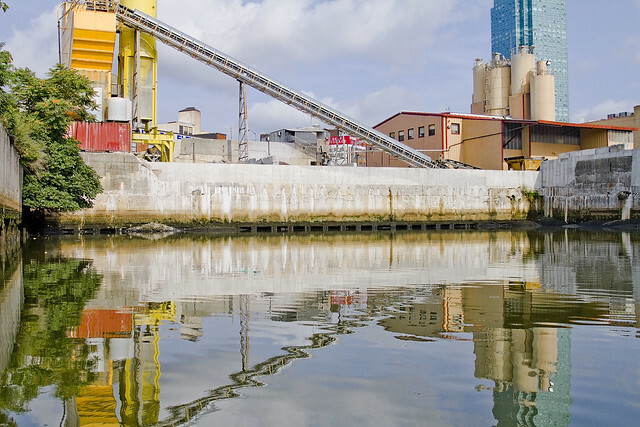 The concrete industry around Newtown Creek often has fingers pointed at it, but again, large industrial concerns need to be sited “somewhere” to serve the interests of Real Estate and construction. The goal of many, including myself, is to ensure that in the days following the EPA Superfund cleanup of the Creeklands is that industry still feels welcome here. 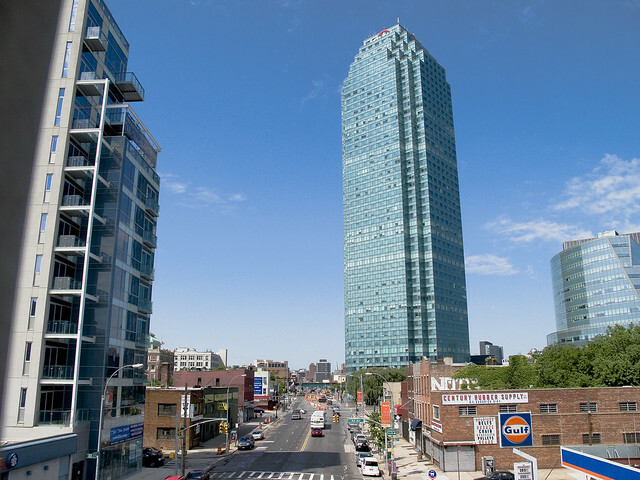 White collar corporate jobs are not an option for many, which is something often forgotten by those who spend their days in air conditioned Manhattan offices imagining the future of Queens. These dirty industries must be compelled to “clean up their act” but cannot be regulated out of business. 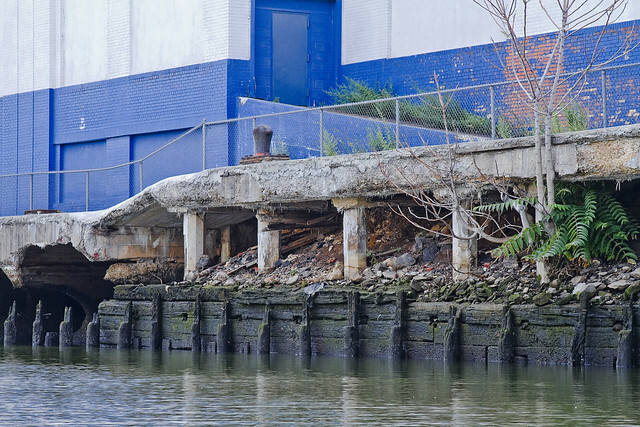 The boat turned away from the north eastern bulkheads of the Dutch Kills Turning Basin and we explored the bulkheads of the southern abutment. Again, the waters had carved into the underpinnings of the engineered ground. More abscesses and grottoes were observed cut into the cement and the visible wood seemed spongy and softened from the action of unknowable forms of microscopic life. I had to “bust a move” to conquer the deep shadows of early morning light here, as the merciless and burning thermonuclear eye of god itself was shining down unoccluded by cloud or atmosphere at this point. An external flash was attached to my trusty camera, which was “bounced” off the water. Anomalously, the green water created orange and red shadows in the reflected bursting of light. The Riverkeeper Captain who acted as our boatswain, John Lipscomb, checked his watch and announced that we had to beat a hasty retreat as the tidal actions of the East River would soon cause Dutch Kills to rise. Fearing that we might be trapped in Dutch Kills for a long interval, and having completed only a tiny fraction of our mission, Captain Lipscomb set course for the larger vessel which had launched our tiny “Tin Boat” which was docked at Whale Creek. The physical effects of the air and environment here were enormous, but the effort and risk of the journey were worth undertaking. 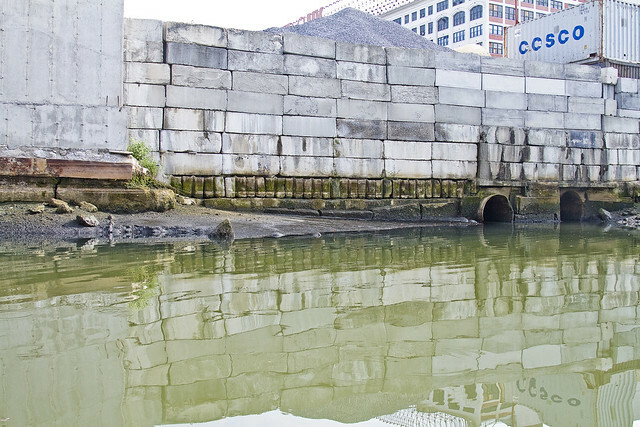 Long have I desired to see Dutch Kills from water level, and to see the place as few others have.